TheatreWorks opens the 2013/2014 season with another Regional Premiere – Jon Robin Baitz’ Other Desert Cities. Baitz’ title was inspired by a California freeway sign and two cities in the Middle East. The freeway sign is an odd one along Interstate 10 near Palm Springs where most of the story takes place; the cities are Baghdad and Kabul in reference to a war that figures prominently in the plotline. Topical, volatile, and political only partially describe the tone of this production. Between the witty writing, dramatic theme, superb cast, and gorgeous set, this production is a find equal to a lush desert oasis. There’s no doubt that audiences are in for a gripping evening of theatre. In short, Other Desert Cities is about long-held family secrets and wide political schisms that threaten to blow a family apart. The story starts in 2004 and references the Vietnam and Iraqi wars along with an internal war of politics and family scandal. Lyman (James Sutorius) and Polly (Kandis Chappell) head the Wyeth family in grand style. They are staunch supporters of the GOP counting many powerful and influential party members as close friends. A former actor turned ambassador, Lyman is the model of decorum and a capable negotiator, but he has his hands full. Polly is Lyman’s wife and is cast in the mold of a Nancy Reagan protégée claiming Nancy taught her “that to control everything, every bit of information, every gesture, every pose, that was the way to live.” Fortunately, there’s a fair amount of humor in the way that Polly does this. The rest of the family members all hail from the liberal side of the political divide. Brooke Wyeth (Kate Turnbull) is the prodigal daughter visiting from the east coast for the Christmas holiday. Between her self-imposed exile from the family, battles with clinical depression, and her career as a writer, Brooke is largely based on Baitz. She’s written a book entitled “Love & Mercy” (the original title of the play) and is seeking her parents’ blessing before she releases her work to the world. Trip Wyeth (Rod Brogan) is the baby of the family. He too has his problems, but he’s made a name for himself in the world of entertainment. He produces and hosts a pseudo-reality television show called “Jury of Your Peers” where celebrities form the jury attacking both the plaintiff and the defendant in various civil cases. Finally, Silda Grauman (Julie Brothers) is Polly’s alcoholic sister, fresh out of rehab, who’s living with Polly and Lyman because she has no place else to go. Brooke’s book, it’s soon revealed, is not a novel but is instead a memoir dealing with her older brother Henry’s demise, a dark period from the Vietnam War era. It doesn’t take long for Polly to start verbally biting into Brooke for daring to write about such a thing. Questions of loyalty and propriety vs. art come to bear in the ensuing arguments. Polly loves her family, but she and Lyman are trying to protect their family’s integrity. Neither wants to reopen the wounds that surround losing Henry or fuel the external scandal that continues to haunt them. Scenic designer Alexander Dodge has created a masterpiece. This run is a co-production with San Diego’s Old Globe Theatre, so the set had to be transported from farther away than the aforementioned Interstate 10 freeway sign. 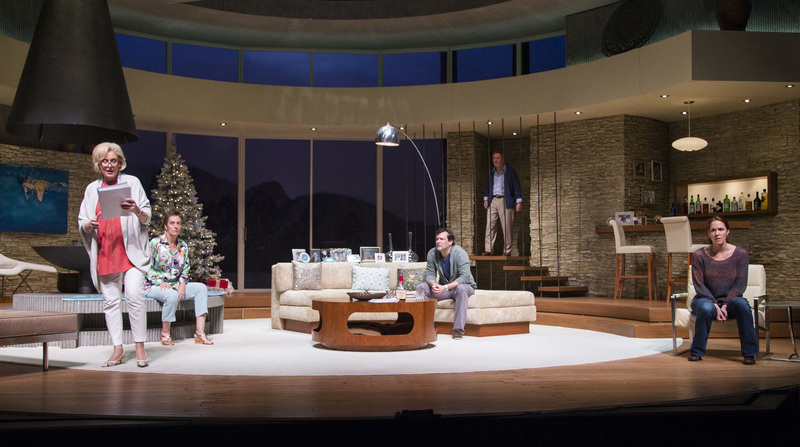 After traveling some 500 miles, the set was reconstructed on the Mountain View CPA stage. As audience members enter the theatre, they are hit with the expansive Wyeth living room based on Elvis Presley’s Palm Springs honeymoon house. With its picturesque high ceiling, a desert mountain view through the upstage floor-to-ceiling window, and detailing down to the decorative stone walls, vases atop a soffit running along the perimeter of the room, fully stocked bar, tasteful living room furniture, and a Christmas tree for the holidays, this is a “home” to be proud of. Directed by Richard Seer, the show maintains a level of authenticity and accessibility. We don’t see the strife right away. As the play starts, Chappell, Turnbull, Sutorius, and Brogan all enter through the back door good-naturedly ribbing one another about their early morning tennis match. Chappell is riveting as she flings dry, very humorous one-liners at everyone, but particularly at Turnbull as they dance around the issue at heart – what’s in Brooke’s book. The interaction between Chappell and Turnbull is genuine and is played very believably. Their verbal fencing is enthralling, but even through the barbs Chappell is able to show that Polly cares about and loves her family, even the much damaged Brooke. She just wants to protect them from the pain of the past. When Brothers makes her entrance a little later in Act 1, Silda’s kind of a whirling dervish in her manic rush through the living room, her hair standing a bit on end. Brothers plays Silda as damaged but with heart. She’s likeable and also vulnerable. And she’s close to Brooke, although we don’t find out how close until later in Act 2. Sutorius plays a straight man most of the time except for a few key melodramatic moments when he lets Lyman’s “inner actor” overrule the very proper diplomat. In one case, he feigns a rather humorous “death” scene. In another, he over dramatizes his “bad back”. Brogan fits comfortably in Trip’s skin and injects snide remarks in the course of smoothing the growing family tensions, but Trip too has his issues. In a momentarily touching brother-sister sequence, Brogan delivers a monologue where he enumerates his various foibles, triumphs, and failures as he’s rolling a joint. In the midst of his discourse, he exclaims rather ironically, “Nobody who takes pleasure as seriously as I do could possibly be happy. Don’t you know that?” Then their discussion turns a bit confrontational, but even in anger, they stay conspiratorial, paired with one another much as their parents are on the opposite side of the political divide. Turnbull’s character has the widest emotional arc, and she handles it with aplomb. She makes us care about Brooke and admire her fortitude. She’s also the vulnerable little sister, eternally grieving over losing the big brother she idolized. When Brooke learns the long-held family secret, Turnbull’s reaction is both extreme and completely understandable. The play’s final sequence is played gently, and the resolution provides a very satisfying desert dessert. Don’t miss this extraordinary production. See http://www.theatreworks.org/shows/1314-season/otherdesertcities or call (650)463-1960 for more information or to order tickets.